John Schlitt: "I had a total peace"
At the time I broke the news about Petra retiring, I was not able to reach John Schlitt for comment because he was on a trip. Since returning, we were able to do a phone interview, where he talks about some of the issues fans have wondered most about. After you finish reading this interview, please add your thoughts and reactions to the messageboard. Josh Renaud: Could you tell me about Petra's recent trip to Europe and the Faroe Islands? I've heard from fans there and it seems like some amazing things happened. John Schlitt: The Faroe Islands are a unique place. They consist basically of islands, no trees, nothing. Just a lot of sheep and a lot of great people. They joke about that fact, too. It's a beautiful place, just different. We got a chance to minister with people there who have a real heart to see lives changed in that country. They brought us in for that reason. We played in a club. The owner was really cool and interested in what we had to say. The band, of course, was just kicked on. A fantastic show. Our message was very plain as usual. We had a lot of secular people there who had never heard anything about the Word before. I think they were very moved. It was a very exciting time. That was the last show of a five-show tour we did in Europe. Every show was great, but this was a nice way to end it. The island treated us very well and they're good people. In the announcement recently posted on your website, you are quoted as saying "We have seen God's hand at work in our music; on every continent, in every language. Music breaks through the language barrier." Can you talk a little bit more about the experiences you guys have had in these countries where the majority of people don't speak English? We've been surprised by that happening so many times: in India, South Korea, Brazil, other South American countries, Europe. You've got to really be shocked to see how God works in, as they say, mysterious ways. You know, the interest in the music drives these people sometimes to investigate what we're saying and even to translate [the songs]. In doing so, they get a message. It's so exciting. You know, Christians are going "This so cool!" And the non-Christians are saying "Wow, is this what they're saying?" It opens doors; it always has. We've always realized that. Music of any kind is a certain generation's tool. Anyone who ignores that is ignoring a powerful tool. Do you see differences in the concerts you play overseas and when you are playing at home? Oh yeah, there are a lot of differences, really. There's more excitement for us overseas. There's just more interest anywhere except the U.S. That's always been a disappointment to us. But what's funny is that when we play in the U.S. there are really heavy duty people who love what we do and they attend. These very faithful fans get the excitement factor going on. By the time the show is over, you've got a bunch of very surprised people who could've cared less if we played or not in the beginning. All of the sudden they're saying "Where'd these guys come from? I heard that they were good, but oh geez." It's a shame you have to reinvent the wheel every night. I think that's what we've been feeling for the past two years. Playing here in the U.S. it's like reinventing the wheel every night. Is that one of the things that went into the decision to retire that you made? I think it did. I guess lack of interest in Petra's ministry here in the U.S. was one of the factors that made us say "Apparently, it's just not going to work anymore." There are other bands that are bigger and there's more interest in them. It's their generation now that is controlling everything, and the generation that's controlling things doesn't like Petra. At least, that's what it feels like to us. You know, we really can't complain. We had two or three generations that have stuck with us very faithfully. To expect a fourth might be expecting too much. But we tried. We tried hard because we really feel that Petra's ministry works no matter what generation. But if our music style and our songs aren't interesting to the people in control, then really our CDs become self-gratifying, you know? What use is that? I guess it prohibits the ministry aspect. Well, it does. Although we fought it for a while, like I said. When Bob came back in, the band absolutely worked hard. Last year we played more than we had the three years before that, trying to get out in front people and let them know that Petra wasn't a dead issue. Like I said, there's always surprise at the live shows. But apparently, there were not enough live shows. When it was all said and done, looking at this year and seeing a lack of dates, and other stuff too, we said "It shouldn't take a herd of elephants to stampede over us to realize there's a herd of elephants." It was time. We knew the time was going to come. I think Bob and I both had peace about it. Actually we were very seriously contemplating doing these last two shows in May and calling it quits there. But the more we thought about it, the more we realized that it wouldn't be fair to people who wanted to see Petra. To all of the sudden say "oh, Petra's done" is not fair to Petra fans. We decided to keep things going until the end of the year. That was also on account of Greg [Bailey] and Paul [Simmons], because they've worked very hard to bring the skill of this Petra up to level that I think is hard to compare. To just say to them, "Oh guys, incidentally, we're done" [would not have been fair]. This way, I guarantee you with the quality of musicianship they've showed, I'm sure they'll be with a great band after we're gone and that's what I'm praying for. I think they deserve it. So how early did you start talking about this? I guess we were waiting to see if the festivals would be interested in us this year after playing at all the festivals last year. We did a good job at those shows, I thought. When they all fell through and there wasn't any interest anywhere except in California, we said "There's nothing else we can do." We worked so hard last year to bring Petra into the limelight again. We made a great record that didn't get anywhere near the airplay that we felt it should have. There's nothing else we can do. You can lead a horse to water, but you can't make him drink. There's other things we can do. Bob can write for other people, maybe. I don't know what I'm going to do yet. But the truth is, I don't think either one of us regrets that we made this decision. We'll miss it. My gosh, I'm going to miss hanging out with the guys. Going on the road with this Petra has been just a total thrill for me. I'm going to miss the people. But on the other hand who knows? Maybe God will open the door for me to stick with touring. Maybe this is just one leap from one thing to another. Both you and Bob have said in the past that because of the touring situation it was necessary for everyone in Petra to work second jobs. You are very talented at woodworking and I understand you've also worked with Bob on the guitars he builds. Can you talk about some of the stuff you're doing? Bob's making unbelievable custom guitars. I have woodworking tools that he doesn't need all the time, but every once in a while he'll call me up and say "Hey John, I got this guitar and I need to do something here …" and I say "Okay, come on over buddy." We customize the things. Usually it takes me about 15 minutes and he takes the guitars back to his shop and does all the hand-sanding and stuff that he needs to do. It's really cool. Bob and I are good friends. There's really no one in the Petra history that I can say isn't a friend. Well, maybe one guy — and it's not Louie. I have no desire to ever see [this guy] again. But that's just one person in the history of Petra, and you know there's been a lot of different guys that I've dealt with in recent Petra history! So it's neat that Bob and I are still buddies after 19 years. As far as what I'm doing with my woodworking, I'm very blessed. I've had a lot of very cool people interested in custom stuff that really few guys get to do. That's cool for me. I'm also getting a chance to work with my son who started a company about two or three years ago. He found a position for me. That gives me a chance to hang out with him and travel and do that, too. I'll tell you what, I was very, very anxious about this decision for a while, figuring out how to pay bills and stuff. But God provides. We just have to pray and count on Him and He will provide. You guys were working on new music for a follow-up to Jekyll & Hyde. Is it possible the band would try to perform some of those new songs this year? No, they're out of the book. I thought they were good. I know Bob's writing. We'd have to do a lot of work on the songs and I don't think we want to. If there's enough interest that we actually do a tour, what I'd like to see us do is to go back and grab a bunch of the old songs that the fans would like to hear. Maybe do several medleys. Highlight J&H a little bit more also. But still, go back and do some of the songs that people would like to hear. I think that's what Petra fans deserve. They deserve the best. 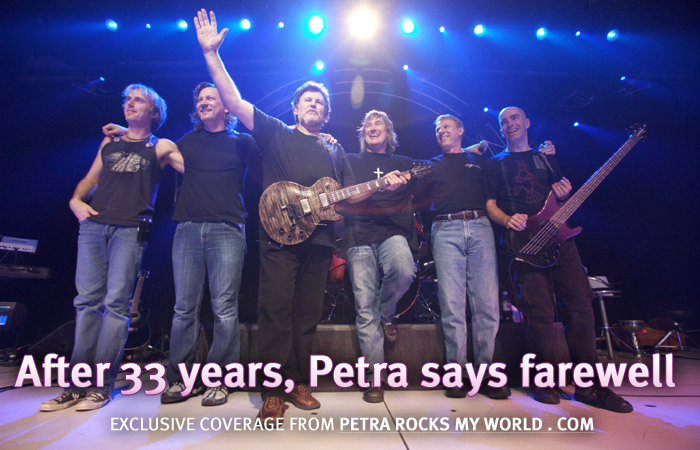 But anybody who comes to a Petra concert deserves the best — and it's always been that way. We've always tried to represent the newest record but also to bring in older material that people request and try to change it around a little for the tour. Hopefully there will be enough places interested in us so that we can do that. If it does work out for you to have a farewell tour, do you think it's likely you'll do a live album or does it look pretty remote at this point? I would say remote. Remember the record company has to agree to it, too. Why would they do a record if we're not going to be touring next year? Why put all the effort into it? As far as I'm concerned, the answer would be: "for Petra fans." I would also like to do it for Greg and Paul, as a way to document how good they are. That's really why I mentioned it to Bob and Wayne [Seboa]. I said to them "Guys, I think we really have an option to do a live record, and I think it would be very cool to do it in Europe. Over there, they think Petra still is cool." And they agreed that was a strong possibility. Is there a possibility of trying to do it self-financed? No, I don't think so. Nothing is impossible, but I don't see the interest from Bob. Like I said before, I think Bob is just tired. [laughs] And I know I'm sort of tired with the whole industry. I'm tired of dealing with the record company, I'm tired of dealing with management, I'm tired of dealing with booking agents, I'm tired of hearing excuses. Well, they're not excuses. I understand. Why wouldn't a booking agent book you? He's going to get 10-15 percent, so it's to his betterment that we play more. So, I'm not saying that the excuses are false. I'm just tired of hearing them. So, I can't think of a scenario right now where we're not going to be done by the middle of November and call it quits. As far as a live album, there'd have to be interest from people other than Bob and me and the guys. There'd have to be more interest. Not just from Petra fans; we've got some really loyal and vocal fans. But the problem is, I don't think we have enough to justify the record company jumping to attention. Speaking of unlikely things, I have a question I have to ask you — because Petra fans always talk about it. In 2003, I asked you about the possibility of some sort of Petra reunion taking place. At that time you said you thought it was unlikely, but if somehow it did happen, it would be very cool. Well, the next year, it did happen. So my question is: do you think there is any possibility for some sort of mega-reunion concert this year? [laughs] Right at this moment, there are no plans whatsoever for that. And like you said before, I said "absolutely not" the last time. And then two or three months later there it was. But that was different. That was the original band. That was sort of cool. I thought that was a cool idea. But, for instance, I don't see Greg [X. Volz] and me ever being on the same stage — only because it's not fair to him and it's not fair to me. It'd be like a competition, and that's not godly. That's not cool. Am I afraid of it? No. Is he afraid of it? I gurantee you, no. I just don't think it's cool. To tell you the truth, I don't think it's Christian because you wouldn't be listening to the message, you'd be listening to the performance and you'd be judging the whole time. So, I'm not really interested in it, to tell you the truth. It wouldn't please me at all and I'd prefer not to do it. What are your hopes for the farewell tour? I'd like to do a tour that hits every one of the major countries that we've been a part of. My dream would be that we'd have a big tour so we could say thank you to everyone who stuck with us through the years. They could see what Petra has become because I'm very proud of it. It's not a haughty pride, it's a blessing pride. Just going out with these guys has been a real treat for me, and I'd like to be able to say "Guys, we're going to let people remember Petra thanks to you." I would like to do a lot of touring. But if it doesn't happen, it's God's will and I'm totally cool with it. As far as bands we might tour with, I really don't care. I'd like it to be very exciting. I hope it's someone who really will draw. I want to talk about you for a second here. Gary Manuel recently said that he had mixed and mastered three of the tracks for your solo album. Is there now a clearer timetable on when the album will be released? Let's put it this way. I've always said that I wouldn't do a solo record until Petra was back on its feet or was closed. Well, it looks like, as much as I wish it was the other choice, [Petra has closed] and it is opening doors for me. I don't really want to do it until I see where Petra is going this year. On the other hand, I'm certainly not going to sit on my hands if there's a chance to do something ministry-wise. I think I'm still supposed to do that. So, yeah, you may be seeing a John Schlitt record ... I don't know how soon, but it will finally get finished. Looking back over the years, how do you see Petra fitting into the history of Christian music. What was Petra's part? There are books about the history of Christian music that hardly mention Petra. I find that very hurtful. But you know what? Everybody has an opinion. I really think Petra's ministry with or without me has been a trendsetter. It has helped developed Christian music as it is today. That's not me talking — it's many, many people who have come up and said the exact same thing. I've had several hard-core friends, the kind who aren't into compliments, call me lately and say "John, how are you doing? You guys are going through a lot right now. How are you doing personally?" And I said, "Well, I'm doing fine." One guy especially says "You know what? Me and a couple of your old crew were talking and we've determined that Petra absolutely is the biggest Christian rock band that has ever been or ever will be. You can put up all these other people, but they're never going to be around as long as you guys have been. They're never going to make the changes or be the trendsetters that you guys have been. I just want you to know John, you should be very proud because you are part of something that will not be again. You have been a big influence on a lot of people." You know what? I think that's true. I think Petra's ministry and its choices in business have been influential. A lot of great bands now will tell you that. The real Christian bands out there will tell you "If it weren't for Petra, we probably wouldn't be doing this." What a thrill, man.